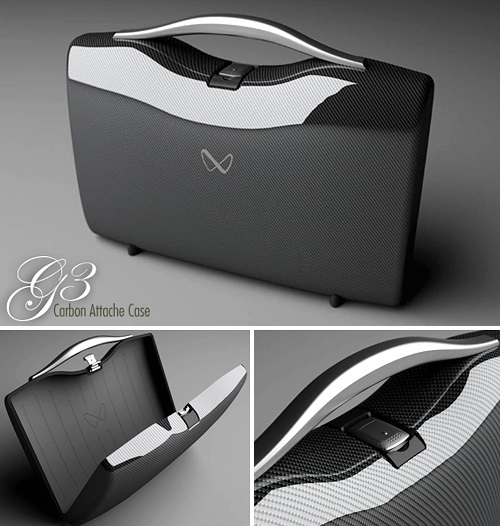 G3 Carbon Fiber Attache Case | OhGizmo! Nothing makes you look like you’re ready for business than carrying an attache case. Even if you only use it to hold your lunch, people will still think you’re on your way to some important meeting with a bunch of corporate bigwigs. So imagine what carrying a carbon fiber version would do for your image? The G3 Carbon Attache from Nikola not only has a sleek design, but the carbon fiber outer finish will make you look like an international spy en-route to an assassination. The G3 can also be customized with different feature options but the top of the line model will set you back about $3,600. It’s not cheap, but it’s not ridiculously expensive either. However if you want to look like you’re important but are on a tight budget, here’s some free advice. Just get a cheap attache case and a pair of handcuffs. If you walk around with an attache that’s handcuffed to your wrist people will think you’re important enough to carry launch codes, mountains of diamonds or even the results of the Oscar voting.